The millimeter wave technology is also referred as extremely high frequency. It operates at a frequency range between 30 Ghz and 300 Ghz. The adoption of fifth-generation technology will led to the growth of 5G technology. Millimeter wave supports wireless communications with best convergence of Wi-Fi and cellular services. Millimeter wave technology is widely used in sectors such as consumer & commercial, mobile & telecommunication and healthcare. It is expected that the market for millimeter wave technology will grow rapidly during the forecasted period at a good CAGR. Rapid rise in demand for higher bands and high data speeds are expected to drive the growth of millimeter wave technology market globally over the forecasted period. Millimeter wave technology is in great demand in telecommunication industry which also expected to increase the market growth of millimeter wave technology globally over the forecasted period. The global millimeter wave technology market is studied for the Asia Pacific (China, Japan, India and rest of Asia Pacific), North America (the U.S., Mexico, and Canada), Europe (the U.K, Germany) and Rest of the World. North American holds the largest share in the market, in terms of revenue due to deep research in military applications and presence of this technology in sonar, radar and secure military communications. Increasing need for high-speed data transfer coupled with the overuse of the existing spectrum in the telecom industry also expected to bolster the growth of millimeter wave technology market in this region over the forecasted period. Asia Pacific is anticipated to be the fastest growing market of millimeter wave technology in terms of revenue over the forecasted period due to rising infrastructural deployment for faster access to data, voice, videos and other services. Increasing demand for high-speed network for accessing smart applications on residential and commercial levels are also expected to drive the market of millimeter wave technology in this region over the forecasted period. Setting up new telecom equipment based on the millimeter wave technology also expected to drive the growth of this technology in this region. 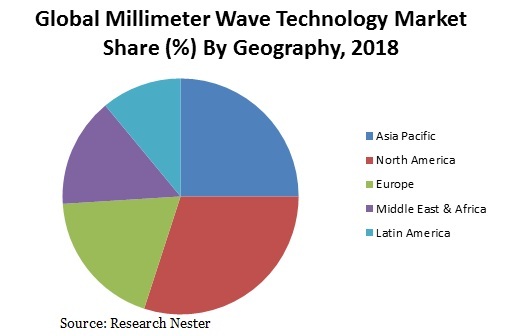 Increasing mobile data traffic, growing demand for the high speed data connectivity and rising demand for band intensive applications are the factors expected to drive the growth of millimeter wave technology market over the forecasted period. Technological advances increases the demand for millimeter wave technology in various industrial verticals such as aerospace, defense, healthcare, telecommunication and automobiles. Data-intensive services such as high-speed online gaming, video conferencing, video streaming and media exchange over the internet are expected to spur the demand for high-band fostering the demand for adoption of millimeter wave technology over the forecasted period. Advancement of 5G is also expected to drive the market growth of millimeter wave technology globally over the forecasted period. There are many projects ongoing to integrate the millimeter wave technology into the cellular networks to use the millimeter wave band wide spectrum. Around 7 GHz of continuous band is available globally, at 60 GHz unlicensed band, which are also expected to drive the market of millimeter wave technology globally over the forecasted period. Non-uniform licensing approach expected to hamper the growth of millimeter wave technology market globally. Key Information for Players to establish themselves in current dynamic environment.